As one of the very first Japanese luxury vehicles to come out of the Honda Motor Company line, Acura cars and SUV’s are quality investments. When you purchased your Acura, you made a great choice. At Mike’s Auto Service, we know how to protect your investment with routine Acura service. And when you need Acura repair, our ASE certified auto mechanics have the training and experience to solve the problem the first time, every time. We provide a wide range of auto maintenance and repair services for all Acura models, including oil changes, tune-ups, minor repairs, major repairs, and more. Whether you own an Acura RDX or an Acura MDX, we have the expert training and resources needed to get you back on the road in no time at all! As a family owned and operated company, we are passionate about work ethic and integrity, which is why we offer high-quality work at economy-based prices. 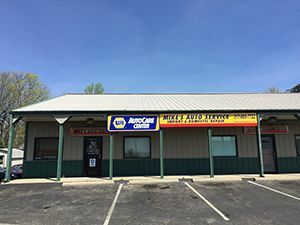 Compared to the Acura dealership, our NAPA® authorized auto care center can provide expert service for less. And rather than pushing you through the system, our technicians use a concentrated approach to inspect and diagnose Acura issues, and take the time to answer your questions clearly in a language you can understand. Our ultimate goal is to get your vehicle back on the road safely, and at a fair price. Call our office today at 317-889-7722 to learn more about our Acura repair services, prices, and availability.